Keeping it real, Kathmandu is a shithole. I never get headaches, except when in Kathmandu. The air quality is terrible, not to mention the place recently got hit by a massive 7.8 magnitude earthquake, and it wasn’t the prettiest of cities to begin with. Nepal is a country of contrast. This little country is home to the highest mountains in the world — which I summited (sort of) — as well as renowned jungles that have man-eating tigers and other animals that prey on humans. In the same week, I toasted champagne to the top of Mt. 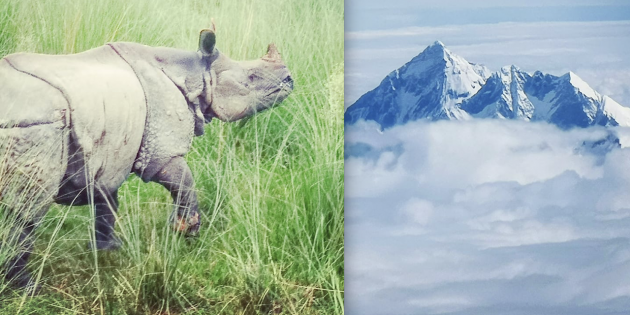 Everest and dodged rhinoceroses in 2-meter high blades of jungle grass while on a safari. I also danced with Nepal’s former prime minister and flew with the country’s Maoist leader. That was all in just one week?? Yes! I arrived in the Nepali capital, coming directly from Hong Kong (and indirectly from Macao) — a contrast indeed. Culture shock too. The wealth, commerce and skyline of Hong Kong gave way to the poverty, pollution and sprawl of Kathmandu. But my hotel was an oasis in the center of the city. I settled into Dwarika’s Hotel, received a two-hour traditional massage and felt rejuvenated. The tasty Nepali curry also helped awaken my spirits. Kathmandu has more to offer in terms of architecture than most shitholes. Or should I say had more to offer? Kathmandu’s Durbar Square, located in front of the old royal palace of the once kingdom of Kathmandu, used to have spectacular architecture. But several buildings collapsed due to the 2015 earthquake. In fact, many parts of the city still lie in rubble, while some buildings remain under construction. In spite of the damage, there are still interesting buildings to see, particularly at Durbar Square. The square offers a variety of Hindu and Buddhist temples, and the royal palace did not collapse. Also, on the outskirts of the city, there is the Boudhanath — basically a big, colorful Buddha. 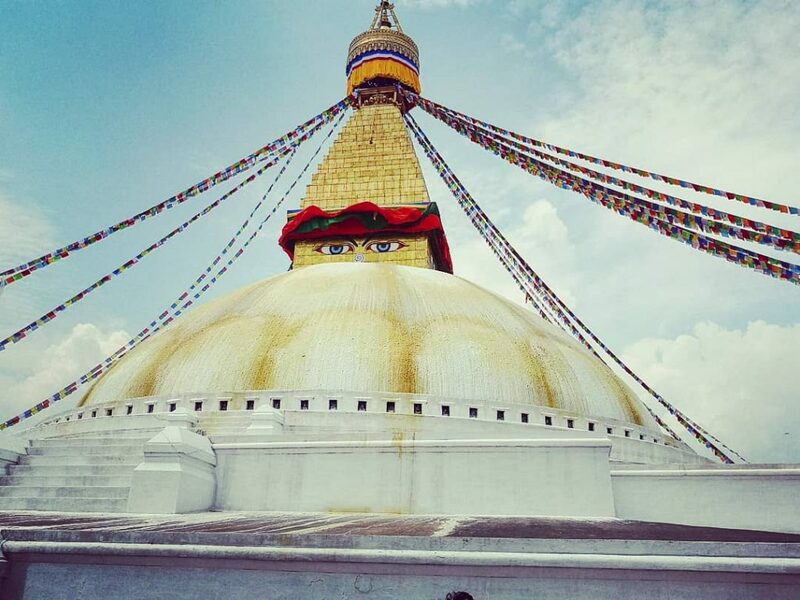 The Boudhanath is actually a stupa, or meditation temple. It’s 36 meters high, circular shaped and surrounded by spiritual centers. Given that Kathmandu has all of these attractions, I guess that’s more than you can say for any other earthquake-ravaged shithole. But, out of the city we go! And there is the peak of Mount Everest…! I don’t mountain climb at quite the speed that I travel the world. One day I may return and summit Everest on my feet (Once I’ve traveled to every country on earth, I might start conquering mountains), but for now I use transport to get to the top of the world. My mode of transportation up Mt. 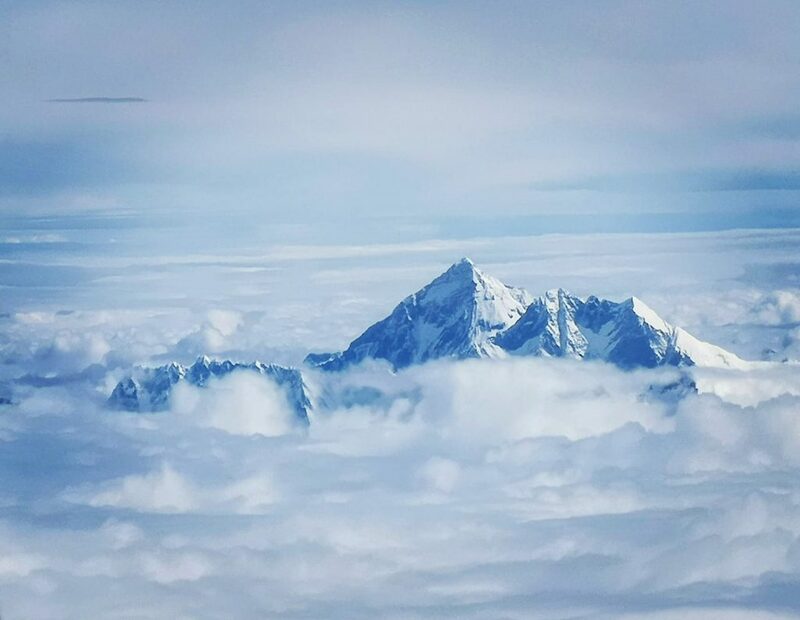 Everest was Yeti Airlines. My first Yeti flight wasn’t the greatest. No avalanche, but it was cloudy and we couldn’t see much of anything until suddenly… there was the peak of Mt. Everest! It was a pleasant surprise to, out of nowhere, see the top of the world after seeing nothing but clouds until then. But I was determined to do it again. 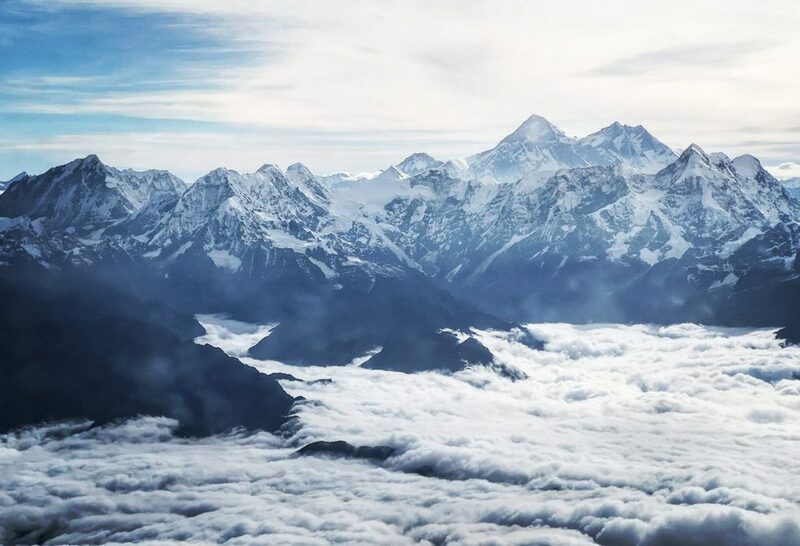 I wanted to conquer the Himalayas — not just Everest — by air. When offered another flight as a concession for bad weather, I took it. The second time around not only did I get better views of Everest, but I got to see a bunch of Himalayan peaks. Additionally, I was allowed into the cockpit, where I got to watch the pilots in action as they were flying right by Everest. Mix in some champagne with that, and it is summiting the world done right. Not your average in-flight experience, I’d say. Back down on earth, I wouldn’t have the comfort of indoor travel as I explored another Nepalese place possibly as dangerous for humans as Everest. In the jungles of Nepal and the adjacent villages, man-eating tigers are known to slaughter dozens of humans. Watch some Animal Planet show and you’ll hear about the tiger that alone killed 436 people in Nepal and India or the Nepali man who witnessed his brother being eaten by a tiger. The Bengal tigers, in particular, are ones to be on the lookout for. This triggered memories of the German traveler being killed and eaten by a cannibal in French Polynesia. I managed to avoid the German-eating cannibals during my trip to the Marquesas Islands, but that was a much different situation. As a man who towers over most of the Polynesian inhabitants of the island of Nuku Hiva, if need be, I think I could handle myself in a fist fight. The tables are turned, though, when running into a man-eater in Nepal. Theses beasts can kill their prey with just one bite. 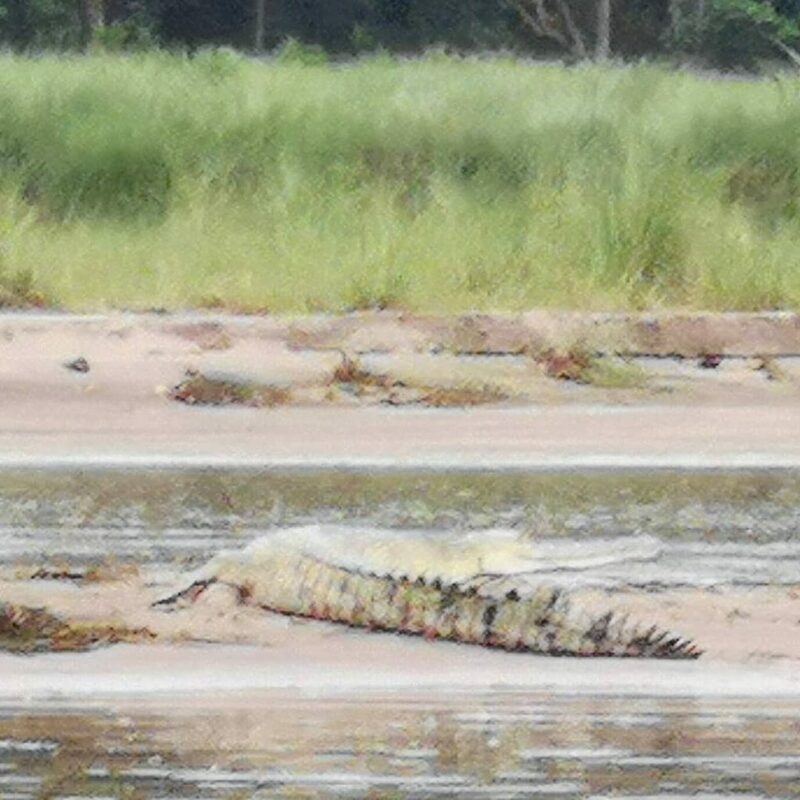 In addition to tigers, Nepal’s sloth bears, crocodiles, snakes and elephants can kill humans, too. Inside Chitwan National Park, the location of my Nepalese safari, I was on the lookout for a man-eating tiger. It never came. My Nepal jungle experience was void of locking eyes with an animal that regularly eats members of my species. But my Nepal jungle experience was not void of a dance with death. My particularly close encounter came with a rhinoceros, another animal that is known to occasionally kill some humans in Nepal. It was during a jungle walk I was on with two guides. You’d think having two guides would assure my safety, but there was an ominous sign, at least to me. The guides were only armed with sticks. This wasn’t like Svalbard where both guides and locals would walk around with rifles to ward off the polar bear threat. If a hungry man-eating tiger were to come for us here, we would have little more to fight with than our fists. When the rhino appeared, it was just 10 meters away. It was a mother rhino that was with her baby — a very dangerous sign. As with the man-eating tigers, the female rhinos are very protective of their children and can become very aggressive when they are with their kids and encounter a human. Unfortunately, the run-in with the rhino came at a moment in which we were not in the typical 2-meter high jungle grass. Rather, we were in a small patch of open grassland. Acting quickly, we hid behind the first tree we saw. It turns out rhinos have bad sight, and when you hide behind a tree, they quickly lose track of you. The plan worked. After we hid behind the tree, the rhino lost sight of us. We then scampered away to safety. Dodging the rhino wasn’t my only exhilarating experience while on my Nepalese safari. I also took a bath on top of an elephant in the middle of a river full of crocodiles. It only made sense to do so, since if I were to bathe in the river, I would be eaten. My bath lasted for 15 minutes. The elephant soaked me. The current of the water splashing against my face was actually quite strong. I had to turn my back to weather the blows. Otherwise I might go blind. Not all elements of the safari were nerve-racking. I rode elephants and jeeps around the jungles, where I saw lots of rhinos, birds, deer, monkeys and Gharial crocodiles (not the Cage of Death crocodile but impressive creatures nonetheless). 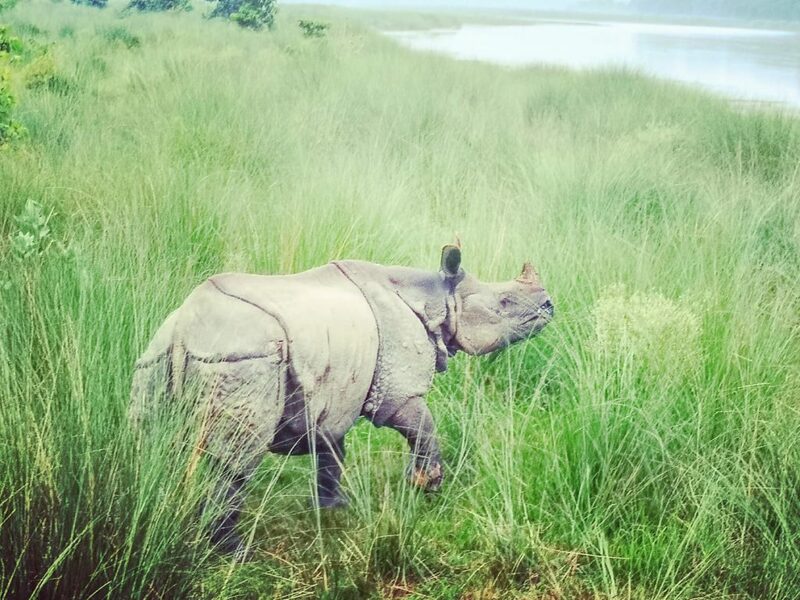 As well as for its man-eating beasts, the Chitwan National Park is famous for its nearly-extinct rhinos. I got to see a bunch of rhinos up close, but in less threatening situations than the mother that nearly charged us. This is all great fun for an animal lover like myself. 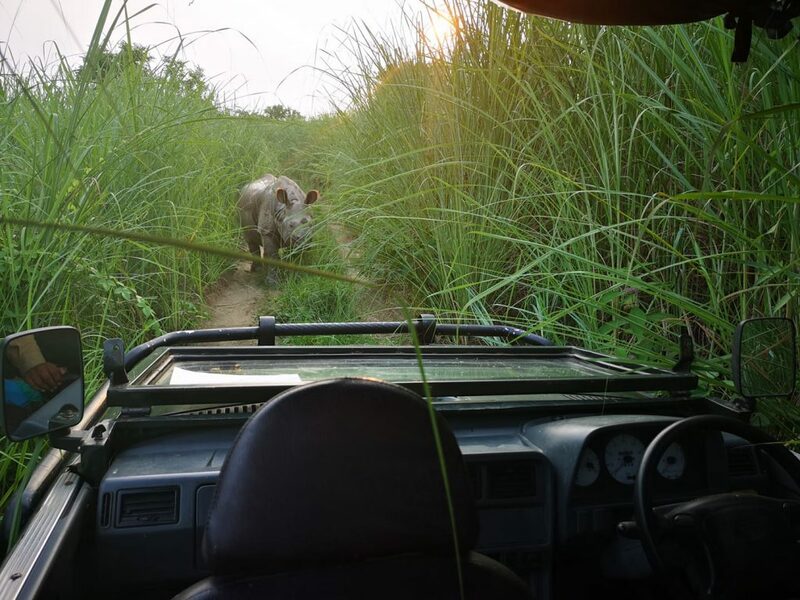 What to do when a rhino is blocking the road? While my lodging on the outskirts of the Chitwan National Park might not be as action-packed as sleeping in a village ravaged by tigers, I would be remiss not to mention that the Barahi Jungle Lodge is a great place to stay. 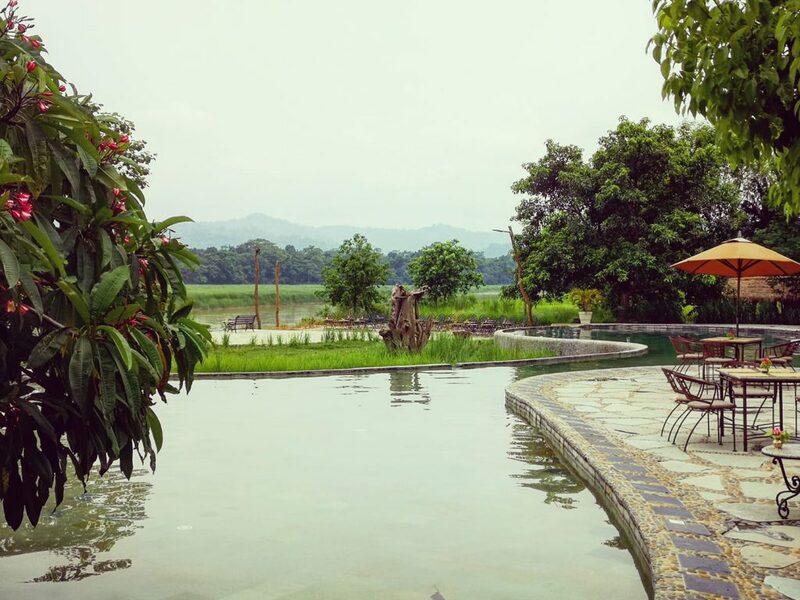 Situated on a bank of the Rapti River with a mountain view, the lodge has good food, service and wifi and a swimming pool to boot. It’s a perfect place to launch a jungle adventure. The jungle lodge also happens to be the place I was staying when I danced with the former prime minister of Nepal. 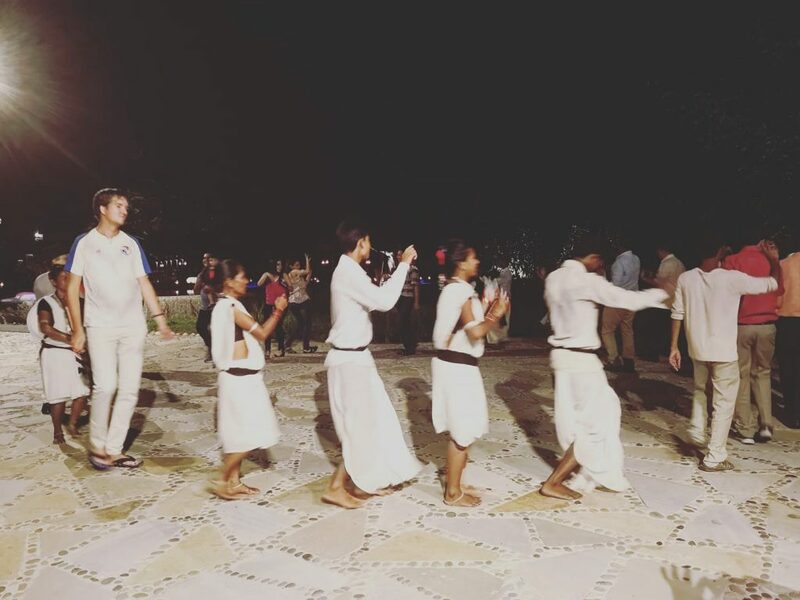 On my first evening at the lodge, there was a family celebration and a cultural dance for the local community. The locals invited me to join the festivities. I danced in a circle with the former prime minister and his family. I happened to be wearing my Panama football shirt, which got me a silly look from the former premier. Maybe it was because my outfit did not match the traditional Nepalese garb. Or maybe it was because the former head of government stashes cash in Panama… What do you think?? This traditional dance went smoothly. Unlike one other occasion in a contested territory, I didn’t get kicked out of the country for partaking in traditional song and dance. The former prime minister wasn’t the only Nepali dignitary who was there with me. There was another distinguished guest at the event, with whom I had already become acquainted on my Nepal trip. That was the Maoist leader of the country. I first bumped into the Maoist leader of Nepal on my flight to Chitwan National Park. It was quite hard to miss him. We were on a 20-seater plane for a very short flight, and he had several bodyguards accompanying him who were armed with pistols and machine guns. After we landed, about 20 heavily armed vehicles whisked the Maoist leader away from the airport. Apparently, he is a high-level politician in Nepal. My cultural acclimatization sped up when I ventured away from the lodge, not on a Jeep or elephant Safari, but rather on an oxcart ride around a village. 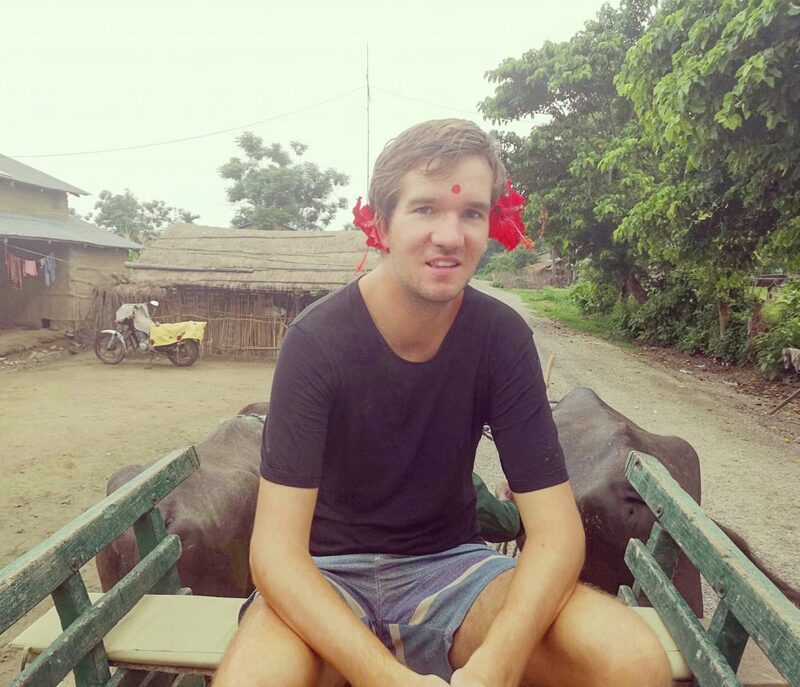 While being pulled by oxen, I got a feel for rural Nepali village life, which is dependent on subsistence farming, wildlife protection and the occasional tourist, such as myself. Inside the village, I had the privilege of visiting the home of a local Hindu family. They showed me their living quarters and let me taste a spirit that comes from rice. Oh, and they painted a special Hindu dot on my forehead. The red dot gave me luck… which I needed in my encounter with the mama rhino. 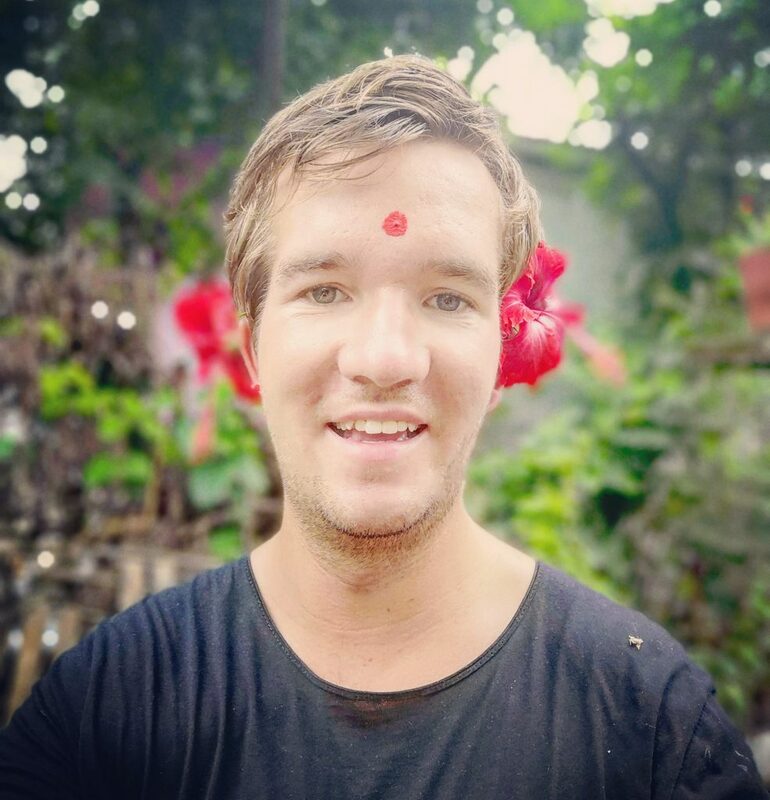 While I did not depart Nepal with the dot on my forehead, I did exit the country with an element — a rather heavy one — of Nepalese culture. During a brief trip to the Nepali city of Patan, a shopkeeper explained to me what Tibetan singing bells are. 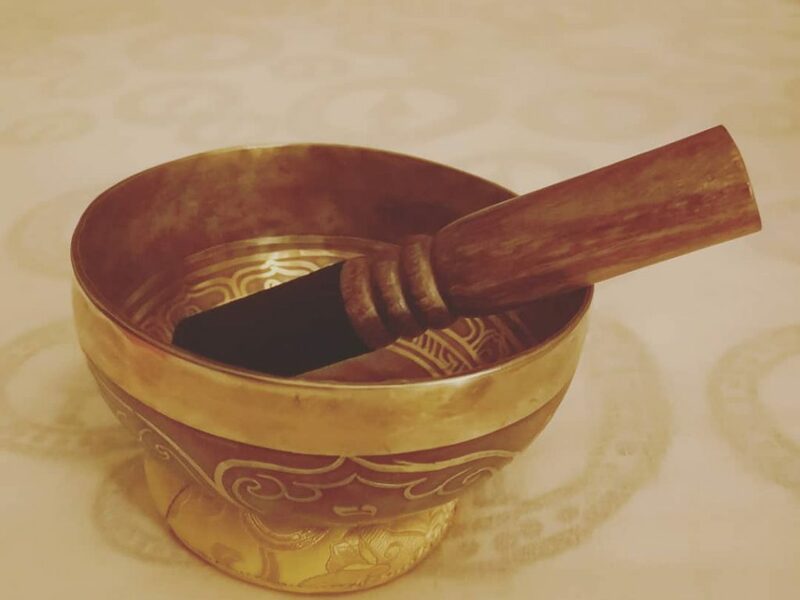 Singing bells, or bowls, (they are shaped like both bowls and inverted bells) are traditional instruments used to help people achieve a meditative state. They don’t just come from Tibet. They also come from Nepal and northern India, and the bells are part of some Buddhist practices, too. Making the purchase was a tough call because now it will be circling the world with me in my hand luggage. Buying a bunch of items while traveling does not blend well with minimalism, but I made the purchase anyway. Now I am counting on the extra weight in my backpack being counterbalanced by the breakthroughs in my meditation sessions. 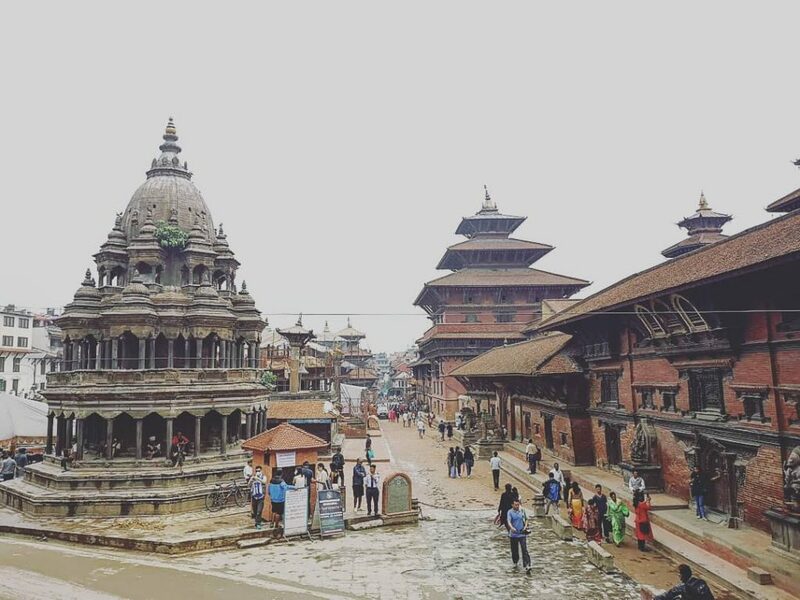 Lastly, I visited Bhaktapur, an ancient city and former capital of Nepal, as well as home to the largest of the three kingdoms in the Kathmandu Valley. The other two kingdoms were those of Kathmandu and Patan. Bhaktapur was cool because I got lost. In Nepal, people are constantly coming up to you trying to sell you stuff, including their services as a guide. 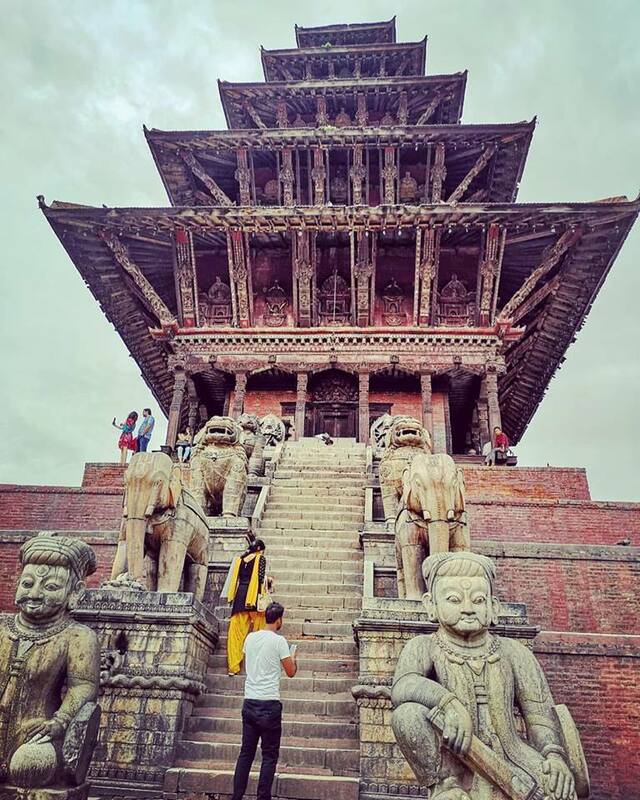 I stayed away from the “guides” and took on the maze that is the city of Bhaktapur on my own. I got lost for about 3 or 4 hours, but during that span, I basically saw the whole town, including the many, many temples it has. Time well spent. I saw it all in Nepal —from the peaks of the Himalayas to the depths of the deadly jungles — but I departed with a feeling of unfinished business. I never got my chance to stare down a man-eating tiger. For that opportunity, I must return. If you are brave enough to join me on a return trip to the jungles of Nepal, you might want to get started with your singing bell practice in advance. It takes a certain level of inner peace to not crap your pants when a beast that eats men looks you in the eye. 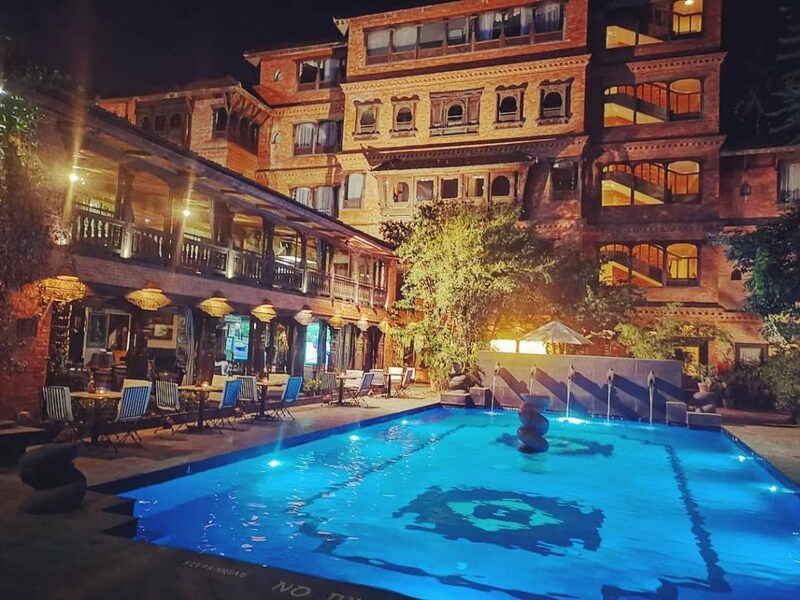 Stay: Dwarikas Hotel in Kathmandu is very nice, but also very pricey. If you are just looking for comfy beds, great service and fast internet with decent prices, go to Kumaris Boutique Hotel in Thamel. In Chitwan, Barahi Jungle Lodge was just amazing. I never got such amazing preferential and friendly treatment in my life – and paying just 200€ a night including full tasty meals, a personal full-time guide and full day safaris is not expensive at all. Eat: I am not a big fan of the typically Asian fare with that much rice, but the Nepalis as the Indians know at least how to prepare a nice curry. Maybe because of only eating spiced curry I did not get my food poisoning Nepal is well known for? Drink: Kathmandu is not exactly a party spot, at least not for me. 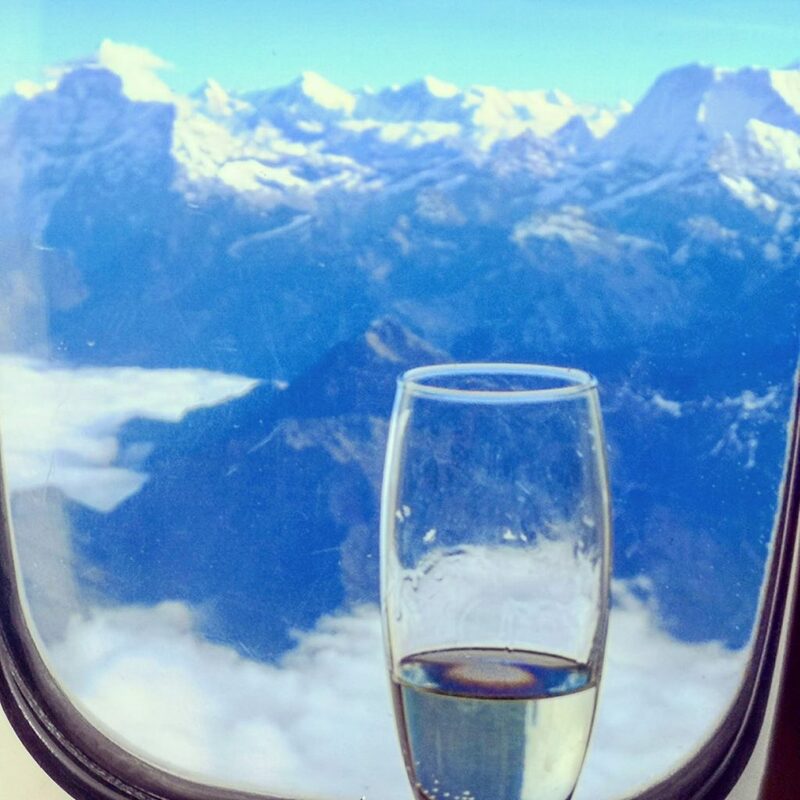 Rather save the money and toast with a glass of champagne flying over Mt Everest! Connect: Google Fi disappointed me. One of the few countries it does not work. Left to Wifi, I was surprised to even have excellent connection in the Chitwan, while Kathmandu surprisingly was worse. See: Nepal is a small, but incredibly diverse country. I just chose some urban sightseeing, a quick overview of the mountains and some jungle experience, but the country offers so much more things worth a return trip. 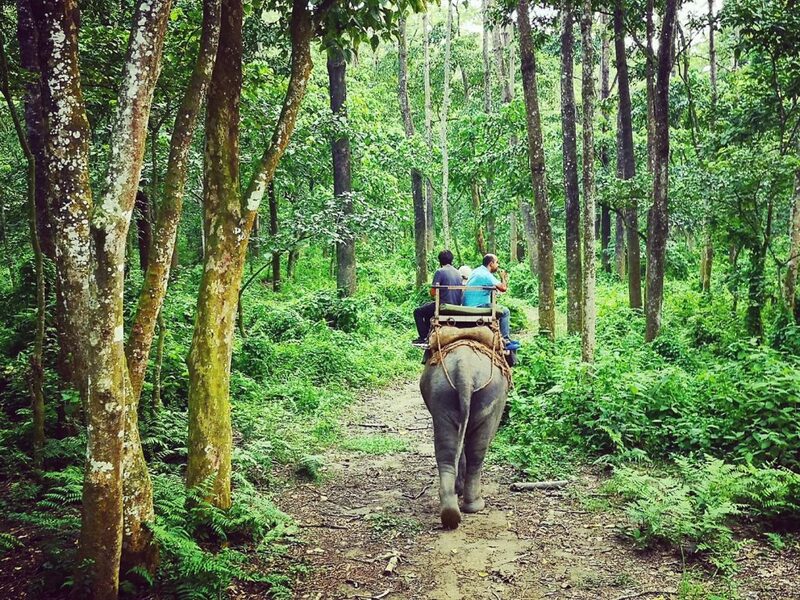 Dont miss Chitwan Jungle – Nepal is not only about mountains. Do: Climb Mt Everest – at least with a plane. 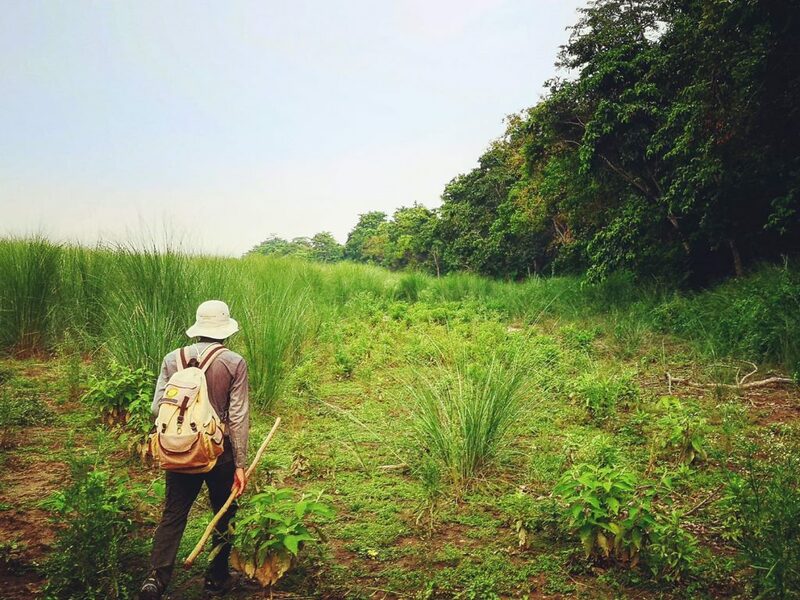 And if that is not dangerous enough, try to find the tiger (or rhino) while walking through the Chitwan jungle. Go there: Nepal is well served from various Asian airports. I went from Hong-Kong with Cathay Dragon and left to Doha with Qatar Airways. Germans get a visa on arrival at the airport, but be prepared for very long waiting times. Go next: Dont miss Bhutan – the mountain kingdom of the thunder dragon. It is just a short 1h flight away and a great destination.